Edward P. Kohn is Assistant Professor of American History at Bilkent University. 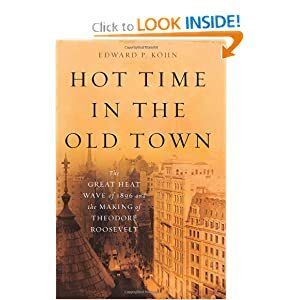 His latest book, on the 1896 New York heat wave, is entitled "Hot Time in the Old Town: The Great Heat Wave of 1896 and the Making of Theodore Roosevelt." During this past summer of record heat, we all enjoyed pictures of children playing in fountains and eating ice cream. To the media, a heat wave means a holiday. This obscures the sinister fact that heat waves are this country’s number one natural disaster killer. On average, heat kills more Americans than floods, hurricanes, and tornadoes combined. Most people are unaware of this as heat waves receive much less attention from media and government than other disasters. Even the Russian heat wave reflected this. Images of forest fires and smoke-choked Moscow filled American televisions, yet the tremendous death toll from the heat wave attracted little attention. Only in mid-August did the Moscow city government report that the death rate in the city had doubled during the heat wave, resulting in three hundred extra deaths every day. The Russian heat wave, then, was a historic and catastrophic natural disaster. But it was underreported and will soon fade from our collective memory. The same can be said of the great heat wave of 1896 that devastated New York City over ten days in August. Every day thermometers soared over the ninety-degree mark, accompanied by high humidity and no wind. Inside the brick and stone tenements of the Lower East Side, temperatures hit one hundred twenty degrees, roasting alive the city’s working poor. As many as thirteen hundred people died, with the average victim an immigrant laborer living in a tenement. In a time of sixty hour workweeks, New York’s laborers literally worked themselves to death. One of these was forty-five year old John Singer, a silver molder who lived in a tenement on Avenue B. Struck down by heat stroke on August 11, he died within twenty-four hours. On his death certificate the attending doctor noted “Summer Heat” as a contributing cause of death. In a foreshadowing of future heat waves, the media grossly underreported the number of heat wave deaths while the city government did virtually nothing. The mayor, William Strong, did not even call an emergency meeting of department heads until the very last day of the heat wave. Instead it was left to individual department heads to take initiative, change policies, and save lives. One hero of the heat wave was Theodore Roosevelt, President of the Board of Police Commissioners. Five years away from becoming president, Roosevelt proposed giving away free ice to the city’s poor. Before the advent of home refrigeration, ice was a life-saving luxury that had been priced out of reach of many poor New Yorkers because of an “Ice Trust.” Roosevelt personally supervised the ice distribution from the police precinct houses, not only “busting” this particular trust, but also having intimate contact with the city’s working poor. Writing his memoirs years later he would remember the “gasping misery of the little children and of the worn-out mothers.” Such scenes must have helped shape the man who was about to become the dominant figure of the Progressive era. The heat wave also helped alter American political history. William Jennings Bryan, the Democratic nominee for the presidency, arrived in New York at the height of the heat wave to officially accept the nomination at a massive rally in Madison Square Garden. That night, thousands packed into an overheated Garden, prompting the New York Times to call it the most dangerous place in America. An emergency hospital was set up in the basement to deal with the expected cases of heat stroke and exhaustion. A further disaster did not occur for one simple reason. With the temperature inside the Garden well over one hundred degrees, and with Bryan deciding to dryly read his speech from a manuscript, thousands of New Yorkers simply left. The next day even sympathetic Democratic papers called the speech a failure, and Bryan’s campaign managers cancelled a further tour through New England. Perhaps never in American history has there been such a reversal of fortune for a presidential candidate within such a short time. Sadly, the lessons of the 1896 heat wave quickly faded. The city did not again give away free ice until a 1919 heat wave, over twenty years after Roosevelt pioneered the scheme. Later heat waves reflected the lack of preparation for dealing with this deadliest of natural disasters. In the summer of 1972 perhaps as many as nine hundred people died during a New York heat wave. As in 1896, the heat took a terrible toll on the city’s most vulnerable citizens, the elderly and the poor. Yet the media did little to prepare New Yorkers, with the New York Times only suggesting “backless dresses” for women. The 1995 Chicago heat wave killed seven hundred, while the 2003 European heat wave killed over 50,000; 15,000 in France alone. These, too, were marked by government inaction and the deaths of the sick and elderly. Today, most cities have heat wave response plans in place even before summer arrives. Emergency cooling centers are set up in local community centers, and officials check on the elderly and chronically ill through phone calls and home visits. While the 1896 New York heat wave and modern heat waves seem to have little in common, in reality they share common origins: heat sources in the city, pollution that traps the heat, asphalt and cement architecture that traps and reflects heat, and the lack of parks and shade. According to the World Meteorological Organization, the number of heat-related fatalities could double in less than twenty years. This latest heat wave should serve as a warning. Until local and federal governments, media, and average citizens understand that heat waves, while less dramatic, constitute as great or even greater a threat to human life than other kinds of natural disasters, people will continue to die from heat by the thousands. And as in 1896, it will be the most vulnerable of our citizens who will perish.